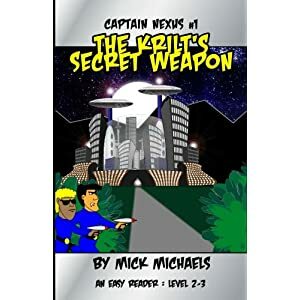 I decided to see how my books look as physical books so I've just released the first Captain Nexus book, The Krilt's Secret Weapon, as a paperback. Overall, I'm pretty happy with how it turned out. As you can see from the Amazon image, it's skinnier than the electronic versions. The actual size of the book is 5.5x8.5 inches, which is the standard size of the easy readers I had here at home. Right now it's only available through Amazon. You can find the book on this page. It costs $ 5.99 (the electronic versions are still just $ 2.99). Since this one turned out OK, I intend to put Prince Jonathan's War in paper as well.